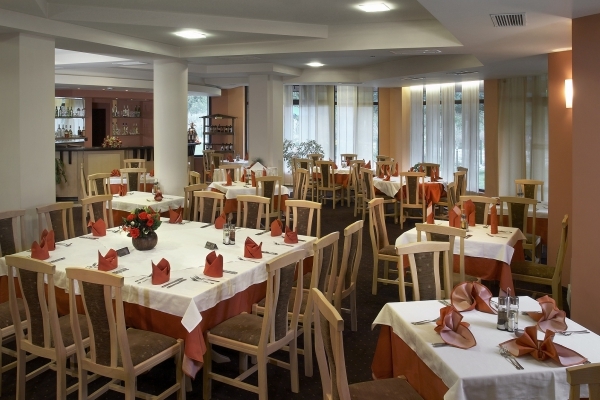 The main restaurant of the Hotel offers a quiet and cozy atmosphere and its staff is prepared to satisfy even the finest culinary wishes. The restaurant is located on the first floor and is open from 08:00 to 23:00. The capacity of the restaurant is 120 seats and a summer garden with 50 seats. Also do not miss the ethnic tavern where you can enjoy national and European cuisines, which is located on the basement level and is working from 19:00 to 04:00. The tavern has a maximum capacity of 100 seats. The tavern wine-cellar offers a rich selection of fine wines which may be tasted in advance. Enjoy full pleasure and gentle music. The tavern hosts a number of original folklore and singer groups during various events. At the lobby bar you will have the possibility to enjoy a variety of drinks, cocktails, sweets. The lobby bar offers a lovely view to the garden, the bar is an excellent place for meeting friends or having a cup of coffee. The lobby bar is on the reception desk floor and is open for 24h. It has a capacity of 50 seats. The mezzanine bar is open for business meetings, cocktails and coffee breaks during conferences and other events. It is located on the conference hall floor and directly connected to the service premises, it offers a discrete and expedient servicing.